Our fun & games camps are mostly about ball sports. 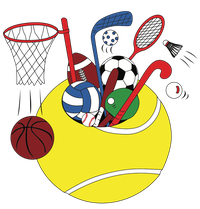 The program includes hockey, tag-rugby, lacrosse, cricket, soccer, baseball, floorball, tennis, as well as running and other ball games. We teach the basic techniques and skills with simple exercises. Then we build up teams, and off you go... Let´s play! Having fun playing games and sports is all it´s about. No previous experience is required - just enjoy the sports and exercises. If it´s too hot we will do refreshing water activities (im summer camps). In case of rain we will just move to a gym for more fun & games. If you have any questions you can reach us by phone: Tel. 0179 - 59 38 559 (Steiko), Tel. 0178 - 46 33 677 (Dagmar) or by email: kidz@kidz-playground.de. summer camps: monday to friday from 7.45 AM to 5.30 P.M.
spring and autumn: monday to friday from 7.45 AM to 5.00 P.M.
Because of the support of the pronova BKK the fee in Hannover is 150 € per child and week instead of 185 €. Thank you! Sign up with your friends right now. We are looking forward to seeing you in our camp!